The fifth map in this atlas represents the African continent south of the Equator along with the islands off the east coast of and some small secondary Indian Ocean islands. With regard to the latter, their dimensions are vastly exaggerated, as was generally the case with every minor coastal features in Portuguese cartography of the age. 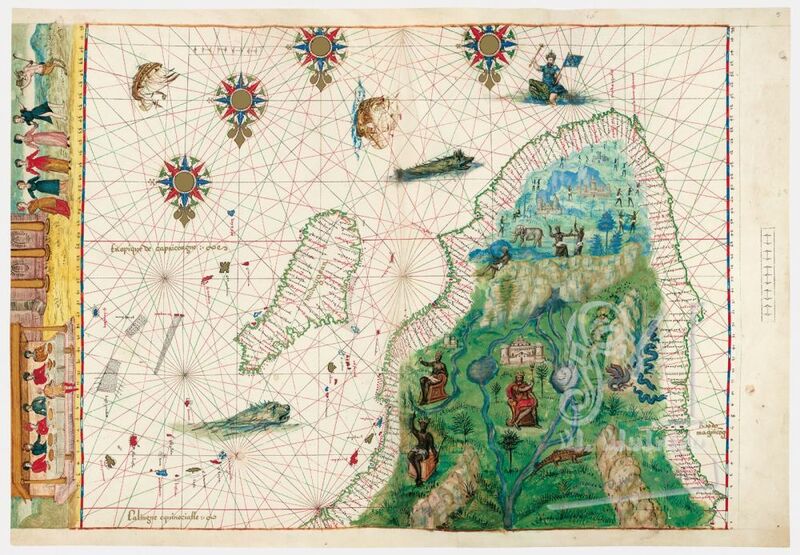 The illuminations, which reproduce motifs that can be seen from about c. 1520 onwards in the maps of the Reinels, nonetheless reveal that some information was known about the interior of the African continent. As can be deduced from a comparison with other coeval maps, the large river with numerous tributaries is undoubtedly the Nile, which was known to originate in the great lakes of East Africa. This supposed Nile shapes between its two branches a large island. A black king has been depicted on it, and, behind him, is drawn his castle or palace, with a fantastic architecture. It is tempting to affirm that this could represent the king of the Congo, who had, in fact, been subject to Portuguese influence ever since the expeditions of Diogo Cão (1483-85) and had converted to Christianity. The other illuminations that cover the African continent are reasonably realistic, much more so than those which illustrate Asia. Apart from a fabulous winged creature, the fauna includes a crocodile, an elephant and various snakes; on the other hand, the flora is uncharacteristic and not very representative. As in the other maps, the scenes represented in the background appear to have been drawn primarily for decorative purposes. More or less fantastic sea monsters have been depicted on the Indian Ocean, along with a carrack and a caravel. Four wind roses have been drawn, in which the north is marked with a fleur-de-lis, as was traditional in Portuguese cartography. As for toponyms, their nautical nature and the fact that they are in Portuguese indicates that these exploratory voyages had little contact with the local populace. One can note the absence of local toponyms that became important from the late-sixteenth century onwards, after the Portuguese had established an effective presence in the area. Madagascar is called by the name it was attributed by Marco Polo and which continues to be used even today, and not by the name of the Island of St. Laurence [Ilha de S. Lourenço], common in sixteenth century Portuguese maps and texts.